Round Rock junior receiver Collin Sullivan after a catch. 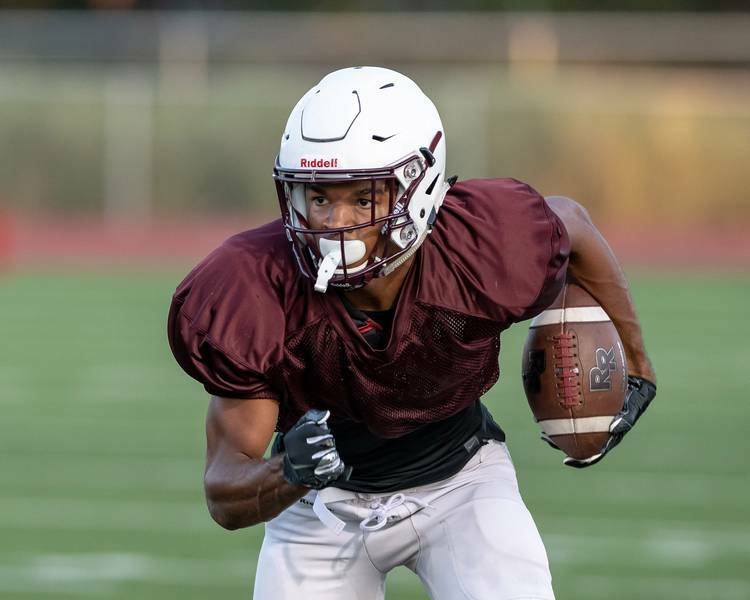 Round Rock hosted Killeen for a football scrimmage at Dragon Stadium on August 24, 2018. Henry Huey for Round Rock Leader. 30. Marvin Mims, WR, Frisco Lone Star (5A), 6-1/165, Undecided — Prolific is the best word used to describe Mims, who was the Offensive MVP of District 5-5A-D1 after catching more than 50 passes for the second straight season. 29. Collin Sullivan, WR, Round Rock (6A), 6-1/184, Undecided — Sullivan is the next great wide receiver from the Austin area. He’s a big, physical wide receiver with strong hands and the ability to win 1-on-1 battles in the red zone and on third down. 28. Prince Dorbah, DE, Highland Park (5A), 6-4/210, Undecided — Dorbah is a two-time state champion and an anchor for the Highland Park defense. He’s a terror off the edge when he’s allowed to pass rush. He could possibly stand up and play outside linebacker in college. 27. Jake Majors, OG, Prosper (6A), 6-4/280, Committed to Texas — Texas found a gem in Majors, who is slightly underrated by recruiting services right now. He’ll slide inside to guard or center from tackle once he arrives in Austin. 26. Jalen Kimber, CB, Mansfield Timberview (5A), 6-1/170, Undecided — Kimber is a big, athletic cornerback who can handle bigger receivers and keep up with smaller, speedy slot receivers. His versatility allows him to play corner, nickel or at safety. 25. James Sylvester, DE, Newton (2A), 6-4/225, Undecided — Newton continues to pump out national prospects despite its small population. Sylvester is next in line and one of the best three-down defensive ends in the state. 24. Bryson Washington, S, C.E. King (6A), 6-2/196, Undecided — East Houston is no stranger to talent and Washington shouldn’t be forgotten because he doesn’t play at Galena Park North Shore. He’s a long, rangy safety who is physical. 23. Seth McGowan, RB, Mesquite Poteet (5A), 5-11/200, Undecided — It’s a good year for running backs in Texas and McGowan is one of a handful of truly elite prospects. His balance is exceptional, as his ability to fall forward at contact. 22. Alfred Collins, DE, Bastrop Cedar Creek (5A), 6-5/245, Undecided — Collins’ potential as a defensive end is through the roof because of his natural athleticism and long arms. He’s also big enough to grow into a three-technique defensive tackle down the road. 21. Darius Snow, S, Carrollton Hebron (5A), 6-1/216, Undecided — Snow is an interesting prospect. There’s no doubt that he is a football player. There is doubt whether he remains a safety or eventually moves to outside linebacker in college.